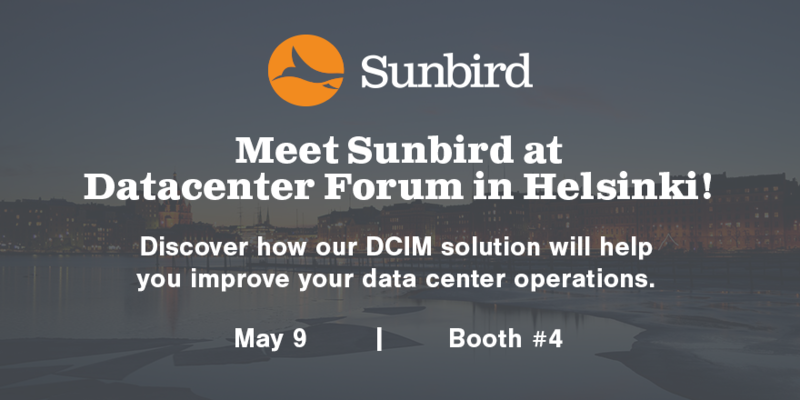 Sunbird is excited to be attending Datacenter Forum in Helsinki, Finland on May 9, 2017 at the Crowne Plaza Hotel. Stop by Booth 4 to meet our data center experts and get a demo of the new features and enhancements in our award-winning Data Center Infrastructure Management (DCIM) solution. At Datacenter Forum, you’ll have the opportunity to network with and learn from over 200 of your colleagues from the datacenter sector in Finland and the Baltics. Data center professionals who are involved with the managing and operations of their organization’s IT infrastructure can attend for free. Learn more and register here. Want to learn more about one of the burning issues facing today’s data center managers and operational teams? Don’t miss our DCIM expert Niall Bannon as he explores DCIM Dashboards: Using a KPI-Driven Approach to Datacenter Optimization from 10:40-11:30. Heading to Datacenter Forum in Helsinki and want to chat one-on-one with a DCIM expert? Our local Sunbird representatives will be available for individual meetings. Let us know if you’d like to meet.